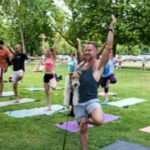 London dogs and their owners gathered together on the Heath for a “ Dog Yoga “ session in celebration International Yoga Day on the 21 st June which falls on the same day as The Yulin Dog Meat Festival in China . 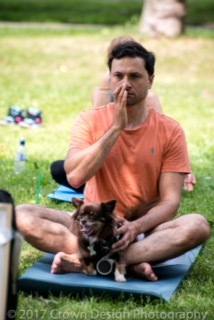 The dog yoga flashmob was conducted and lead by Mahny Djahanguiri , UK’s leading founder and teacher of DOGA and recent Britain’s Got Talent contestant . Robbie her canine sidekick, famously known for peeing in David Walliams Shoes during their Britains Got Talent audition in 2017 kindly supported by showing off some serious doga moves like the” HOT DOG “ for example. Together with him and thousands of other campaigners she is raising money support his efforts in rehabilitating the most traumatised dogs from the Asian dog meat trade especially our Yulin dogs . says ; “Even though it was sweltering hot- it was great fun ! we managed to get our dogs through an amazing 90 min session which went surprisingly well .. supported with litres of water for our dogs and humans . Mahny expected well over 30 londoners showing up for this class . But she had doubts too . “ I thought everyone would drop out in this heat but they all soldiered on for a good cause . Everyone looked so beautiful and relaxed with dogs wrapped in wet blankets – it brought a tear to my eye ! Mahny is in her second year of organising and leading international Doga day . She wants International Doga day ( which will fall each year on the sunday before International Yoga Day ) to be an official day to remember the dogs of Yulin . Her vision is to expand International yoga on a global scale day and triple the amount of participants for next years 2018. 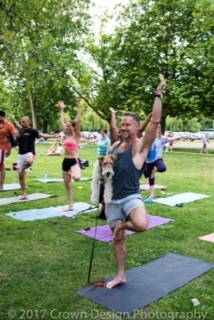 Doga recently went viral when Mahny and Robbie auditioned for Britains Got Talent and managed to get the judges Simon , Amanda and David involved spot of doga with their canine beloved . It went viral in with 2.5 million viewers sharing our audition . This of course helps and encourages people to become more aware of the Chinese dog meat trade which is 365 Days a year . Sadly Yulin festival will go ahead regardless of its 12 million petitions signed . People are furious and passionate about their dogs and animals in general . 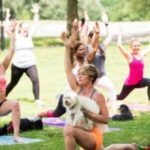 Doga is a wonderful tool to communicate our love for our dogs and our passion for yoga which brings forth love peace and harmony with nature .. which is exactly what we all want ! 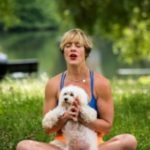 Doga LAMiami Hurricane IRMA -Is there hope for our Yogis and Dogis?